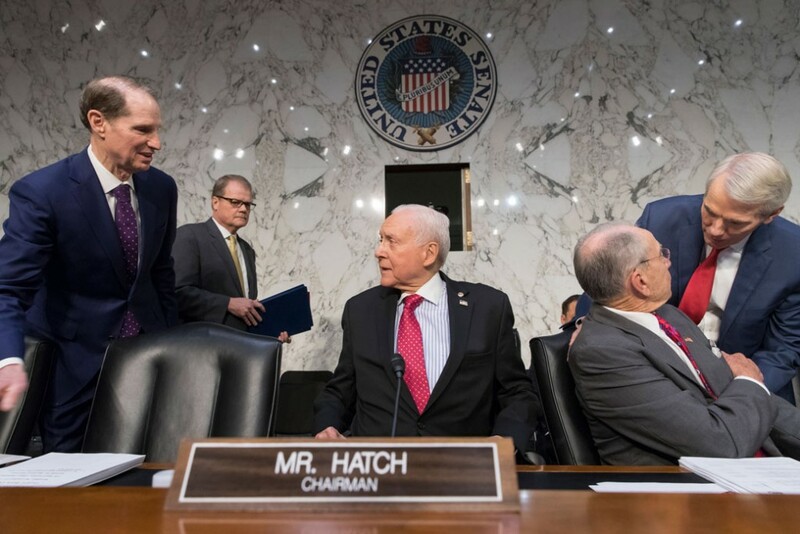 This week, Senate Republicans announced that they plan to pay for their tax cuts for large corporations and millionaires not only by imposing tax increases on the middle-class but also by undermining people’s access to health care. Specifically, they have proposed eliminating the Affordable Care Act’s (ACA) individual mandate, which helps keep premium costs affordable by ensuring that both healthy and sick people have health insurance. Repealing the mandate would drive up premiums by 10 percent in 2019 and lead to 13 million fewer people having health insurance by 2025. A Congressional Budget Office (CBO) report also revealed that the similar House version of the tax bill would result in $25 billion in cuts to Medicare in fiscal year 2018 and hundreds of billions of dollars of cuts to the program overall. Taken as a whole, the tax bill would not only increase taxes for millions of middle-class families but would also have disastrous effects on people’s health care. The Senate tax bill would substantially increase premiums in the individual market for health insurance, and middle-class families would bear the brunt of the price hike. The bill would eliminate the individual mandate—the requirement that people maintain health coverage or pay a penalty. Without the mandate, people would only purchase coverage when they needed it, resulting in adverse selection that would drive up premiums. The CBO estimates that premiums would increase about 10 percent as a result of this adverse selection. The Center for American Progress estimates that this premium increase translates to an extra $1,990 for benchmark plan coverage for an unsubsidized middle-class family of four. Families with incomes above 400 percent of the federal poverty level (FPL)—more than $98,400 for a family of four in the lower 48 states—are not eligible for premium tax credits to reduce the cost of marketplace coverage. 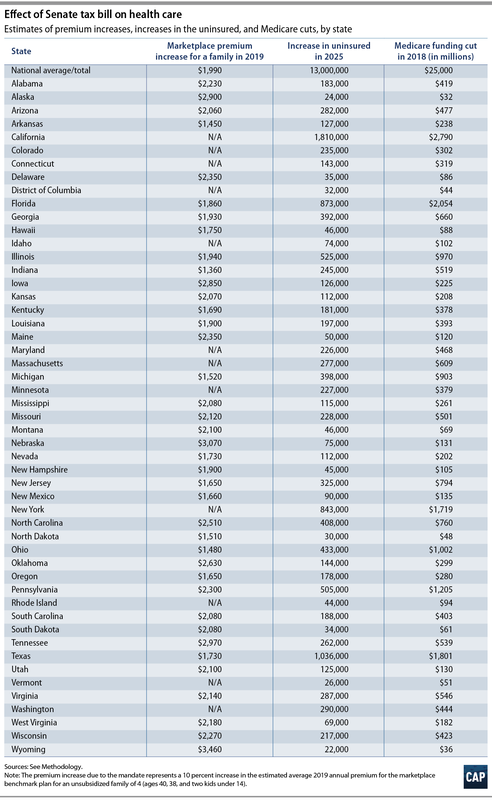 The 10 percent increase would be an even greater financial burden for families in states with higher premium levels, increasing costs by $2,900 in Alaska, $2,350 in Maine, and $2,060 in Arizona. The CBO estimates that repeal of the mandate would result in 4 million fewer people having coverage in 2019 and 13 million fewer with coverage by 2025. As a result, about 16 percent of the nonelderly population would not have health insurance by 2025, compared with about 10 percent currently. The individual mandate is necessary because of the consumer protections put in place by the ACA. The ACA banned discrimination by insurance companies against people with pre-existing conditions, required that people be charged the same amount regardless of health status, and eliminated annual and lifetime limits on coverage. But these protections would also make it easy for people to game the system by only buying health insurance once they needed it. To address this concern, the ACA coupled these reforms with an individual shared responsibility provision, also known as the individual mandate, which requires that everyone maintain health insurance coverage so that the overall insurance risk pool is healthy and premium rates are kept in check. Repeal of the mandate would have two effects on the individual market. First, people who expect to be healthy would avoid purchasing coverage until they need it. As a result, the remaining enrollees in the individual market would be sicker on average, and insurance companies would need to raise rates to cover the increased average cost. Second, the resulting higher premiums would discourage additional people from purchasing coverage through the individual market. Those who become uninsured would no longer have financial protection against catastrophic medical costs, and hospitals and other providers would be forced to provide more uncompensated care. In addition to its frontal assault on health care for the middle class, the Senate bill would also secretly cut Medicare. Because the tax cuts for the wealthy in the proposed bill are not fully paid for, they would increase the deficit by more than $1.4 trillion over 10 years. But the little-known Statutory Pay-As-You-Go Act of 2010 requires that any deficit-increasing legislation be offset with cuts to other mandatory programs, including Medicare. The CBO has estimated that the offsetting spending reductions for the similar House version of the tax bill would cut Medicare by about $25 billion in fiscal year 2018. Given that similar cuts would be required in subsequent years, the total cost imposed on the Medicare program would be hundreds of billions of dollars over the next decade. This would have a particularly harmful effect on rural hospitals with thin margins, which could be at risk of closure as a result. Asking millions of middle-class families to pay more in taxes so that corporations and the wealthy few can pay less in bad enough. But to use those cuts to also undermine health care for middle-class families is unconscionable. Once again, the congressional majority seems to be doing everything in its power to make life harder for everyday Americans, just so it can provide giveaways to the wealthy few. Sam Berger is the senior policy advisor at the Center for American Progress. Emily Gee is the health economist at the Center. Our estimated reduction in coverage in 2025 due to repeal of the mandate is based on national projections by the CBO. The CBO estimates that 13 million fewer people will have coverage in 2025, including 5 million fewer people with Medicaid, 5 million fewer people with individual market coverage, and 3 million fewer people with employer-sponsored insurance. We used data from the 2016 American Community Survey Public Use Microdata Sample (ACS PUMS), available from the IPUMS-USA to tabulate the number of nonelderly people in each state by primary coverage type using a coverage hierarchy. We then assumed that each state’s reduction in coverage was proportional to its share of the national total for each of those three coverage types. For more on the IPUMS-USA data set, see Steven Ruggles and others, “Integrated Public Use Microdata Series: Version 5.0” (Minneapolis: Minnesota Population Center, 2010). We made two adjustments to our ACS PUMS tabulations to account for potential effects of Medicaid expansion in Maine, given voters’ recent approval of expansion. We increased the number of Medicaid enrollees in Maine by 51,000 based on projections by the Urban Institute. We also decreased the number of people with coverage through Maine’s individual market by 20 percent to account for the fact that some enrollees will lose access to marketplace premium subsidies when they become Medicaid eligible under expansion. Enrollment data from the Centers for Medicare and Medicaid Services (CMS) show that 27 percent of 2017 marketplace plan selections were by people with family incomes between 100 and 150 percent of the federal poverty level. Our estimates of 2019 premium increases are based on the CBO projection that mandate repeal will increase individual market premiums 10 percent. We used the HealthCare.gov plan information to calculate the 2018 average marketplace benchmark—second-lowest cost silver—plan in each state, weighting by the geographic distribution of current marketplace enrollment. We then inflated that premium to 2019 levels according to National Health Expenditure projections for per-enrollee cost growth. To calculate the 2019 average benchmark premium specific to a typical family of four, we borrowed the example family composition that the U.S. Department of Health and Human Services uses in its reports: 40-year-old and 38-year-old parents and two children. We estimated that the family would pay an additional 10 percent of that 2019 benchmark due to mandate repeal. Premium data were not available for all states. Finally, our estimates of state-level cuts to Medicare in fiscal year 2018 divided the $25 billion total Medicare funding reduction projected by the CBO proportional to each state’s share of national Medicare spending as of 2014, the most recent year for which CMS National Health Expenditure data is available, using data published by the Kaiser Family Foundation.